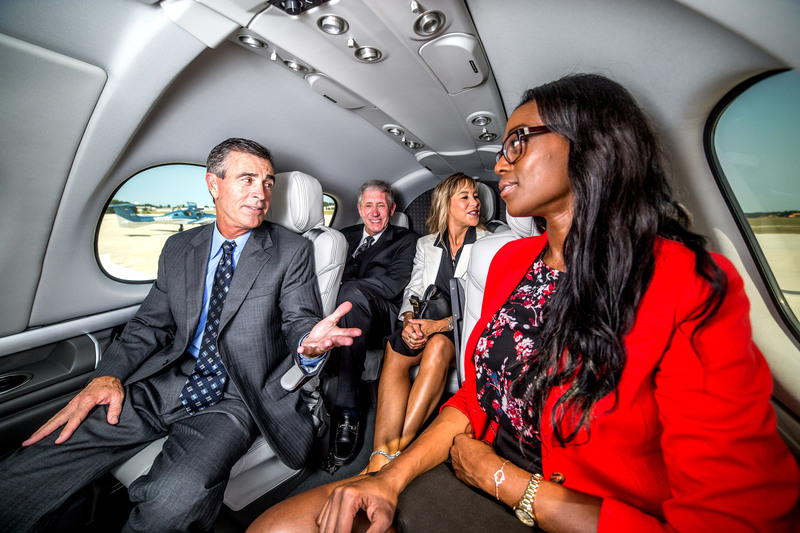 Cirrus isn’t just revolutionizing private air travel; they are creating a lifestyle that enhances your experience of the world around you. Imagine what life would be like if incredible destinations like New Orleans, Salt Lake City, Guatemala, and Chicago were just a short distance from your doorstep. Last month, you went to Guadalajara to explore the ancient pyramids. This month, it’s the turquoise water and soft sand beaches in Havana. With only a long weekend at your disposal, you want to get as much beach time as you can. So, you log into your scheduling portal and reserve the Vision Jet. It’s the perfect aircraft for the trip, with enough space for you, your spouse, and another couple. As a Sugar Land resident, it is incredibly convenient to have an airport just miles from your home. Your flight is booked for takeoff at 7:00 am, which gives you plenty of time in the morning. 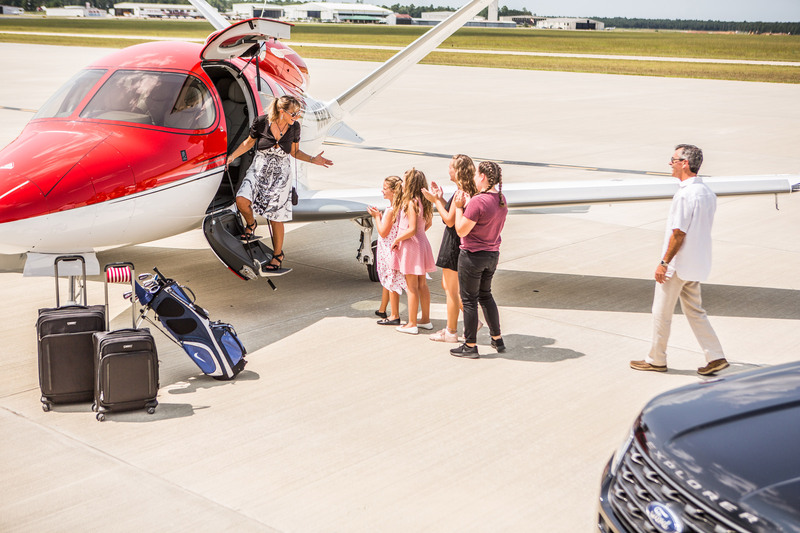 Now that you live a private flight lifestyle, you don’t ever need to plan around long lines, TSA, or the time-consuming onboarding process. Within minutes of pulling onto the airfield, you’re settled in a plush leather seat. The aircraft is clean, gassed up, and cleared for takeoff, and the beautiful beaches of Havana are just three short hours away. This may sound like an imaginary way of life, but for EvolveAir clients, it’s exactly how they choose to spend their time. Our mission is to break down barriers and change the way you experience the world. You only get one life. Invest in moments, not things, and never waste another minute. The SF50 Vision Jet is your ticket to true freedom. The world’s first ever single-engine personal luxury jet. 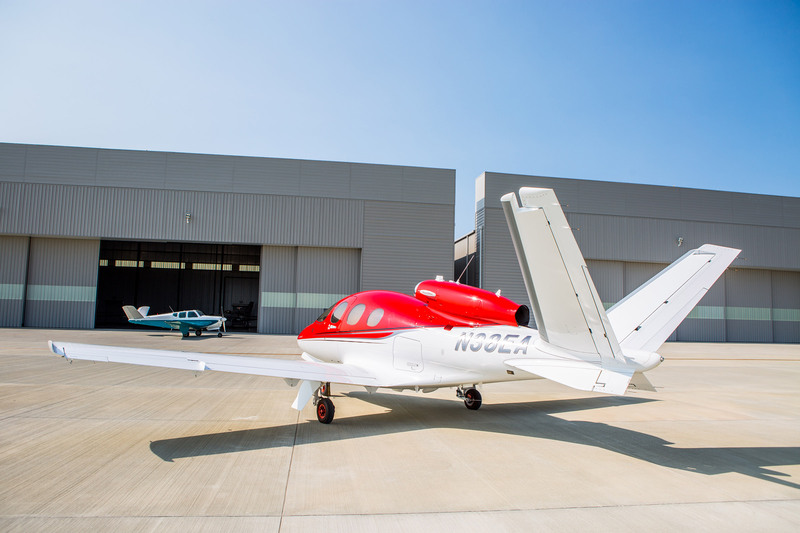 Cirrus is best known for disrupting the market with benchmark aircraft innovations so revolutionary, they require an entirely new product class. 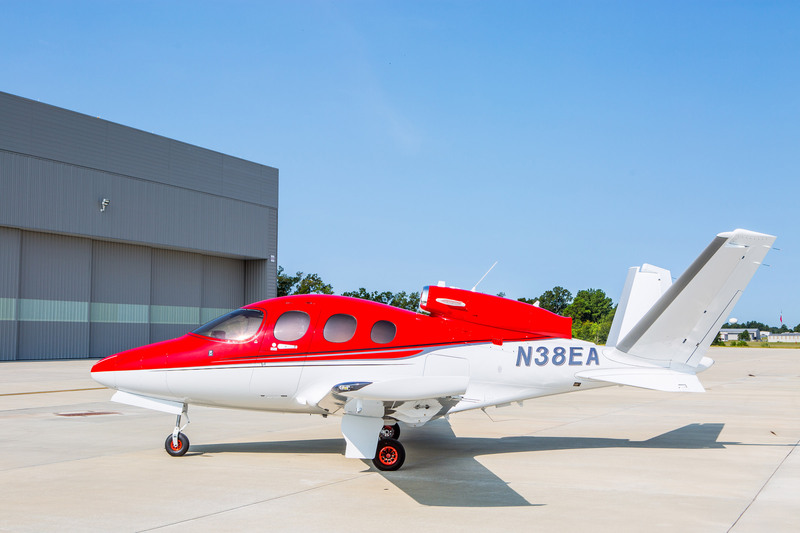 After the release of the SR22T, it was hard to imagine Cirrus engineers topping their own standards for performance, intelligence, and style. But, after more than three decades of research and development, they shattered through the glass ceiling at jet speed with the release of an aircraft so fast and powerful, it represents a new class in aviation. 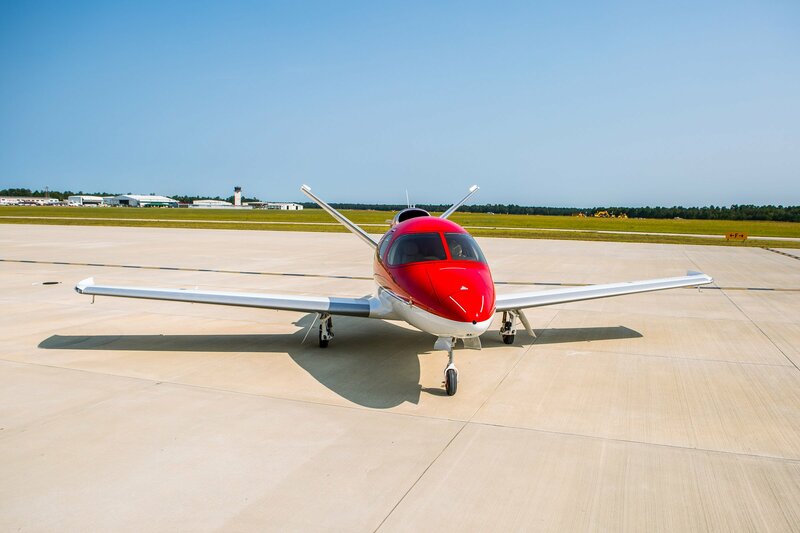 Meet the Cirrus SF50 Vision Jet: a revolutionary advancement in personal avionics. High-performance pistons, an ultra-lightweight airframe, and remarkable fuel burn make the SF50 one of the most efficient jet-speed travel experiences in existence. 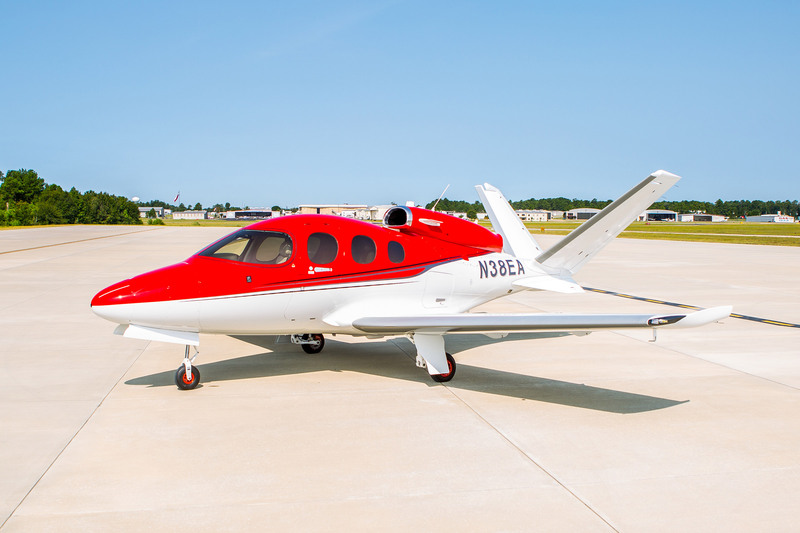 This aircraft is 3x faster than a turbocharged SR22 and is available for purchase at a shockingly reasonable price, making it the most affordable certified jet in existence. Every detail of the SF50 is specifically engineered to simplify flight, challenge the status quo, and explicitly place the power of jet speed into the hands of the everyday aircraft owner. One of the most remarkable features of the SF50 is that it does not require a professional pilot with turbine-aircraft experience. Cirrus engineered the Vision Jet with advanced aviation features like side yolk controls, Perspective Touch™ by Garmin® avionics, Synthetic Vision Technology (SVT), and a single-lever FADEC engine control system to create a flying experience so intuitive and convenient, the average flyer will have all the confidence they need to soar at top speed. The exterior of the Vision Jet is strikingly unique and impossible to miss on the tarmac. Beyond the seamless carbon fiber fuselage, you’ll immediately notice the large windows, massive V-tail, and top-mounted FJ33 turbofan engine, which gives the SF50 a distinct profile that is both sleek and fierce. 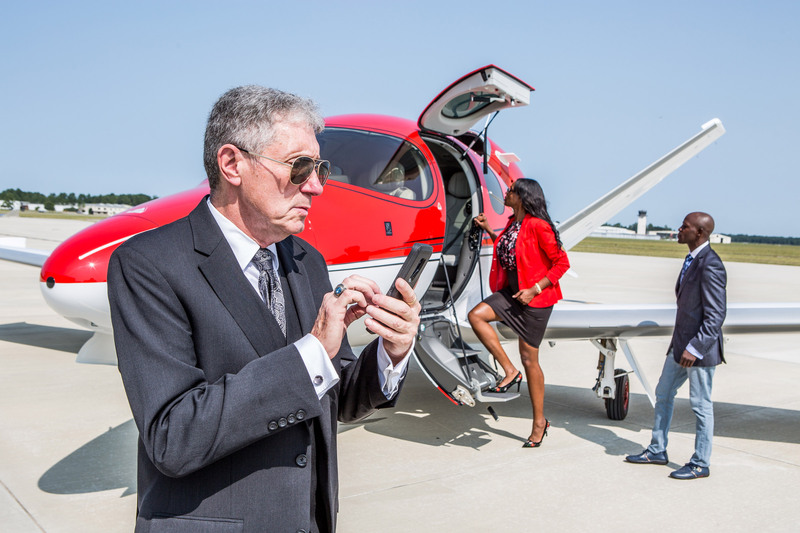 Cirrus is devoutly committed to making bold statements with their aircraft aesthetics. As an SF50 owner, you are exclusively invited into the drawing room to partake in the design process. Select from three different exterior packages, each featuring a charismatic pallet of colors, graphic treatments, and personalization options that guarantee a pronounced finish. The Carbon Package embodies the look and feel of a luxury sports car. Choose from bold new colors, such as Corso Red, Mantis Green, or Monarch Blue, each offering an illustrious aircraft exterior that will be impossible to ignore—especially at full throttle! For a more prestigious look, the Platinum Package is the epitome of elegance. Earthy hues of Sedona Red, Athens Blue, or Driftwood make a sophisticated statement while fluid lines and nickel vents complement the aesthetic appeal. If classic and timeless is your style, the Rhodium Package features three metallic colors: champagne, frost, and titanium. Each hue creates a stunning yet subtle finish that is both alluring and iconic. 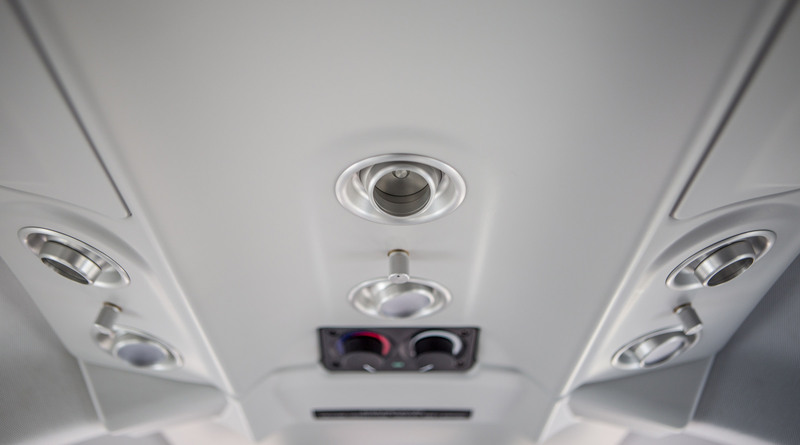 Step a little closer to the Vision Jet, and you’ll see a cargo compartment behind the passenger cabin for additional storage. You’ll also notice an infrared camera, part of the SF50’s Enhanced Vision System. This camera provides fighter-jet-like night vision and a display with integrated 3D mapping that is so powerful it can identify vehicles or animals on the ground. Because of their size and aerodynamic shape, jet planes aren’t the most ergonomic aircraft to board, often requiring that passengers uncomfortably contort their bodies to climb into the cabin. 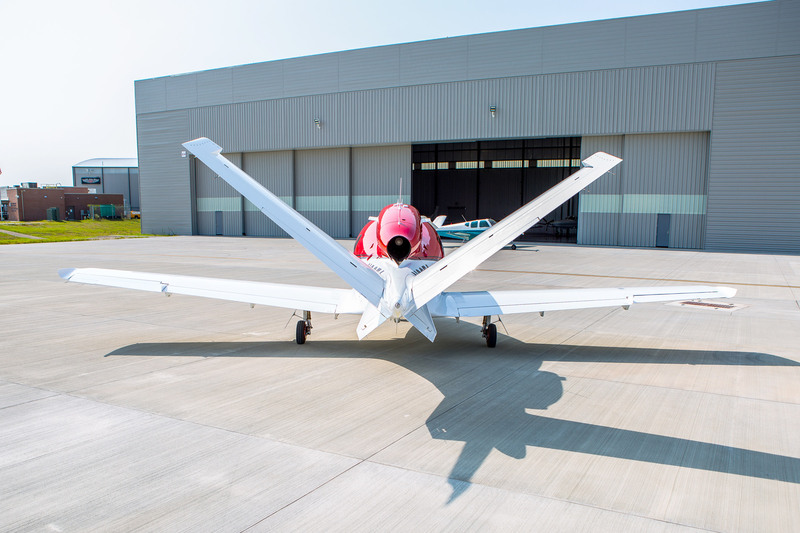 Cirrus completely redesigned the Vision Jet door to eliminate this problem and provide effortless entry. 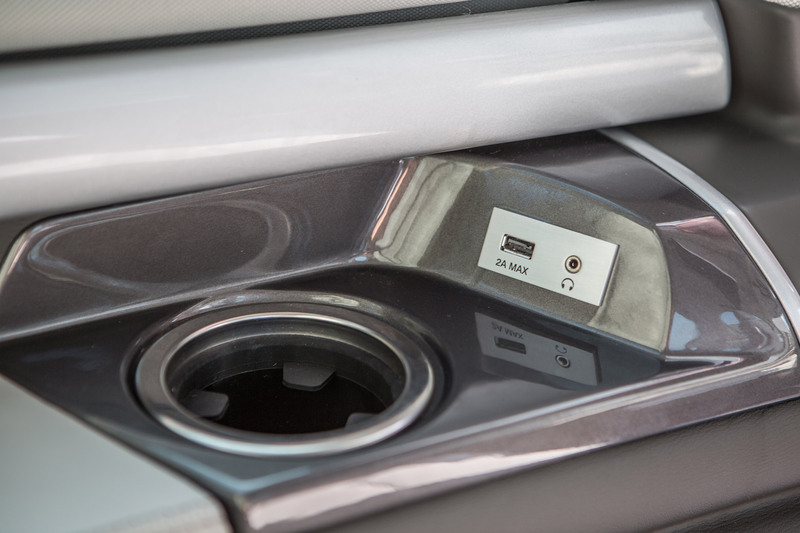 Use a keyless entry key fob to unlock the single bifold, airstair door on the left side of the plane; you’ll be surprised by the sizeable entryway that opens in front of you. Slide the pilot seat forward for additional space as passengers comfortably and safely board the aircraft. The Vision Jet is the realization of a vision to reimagine and reinvent the jet airplane in order to create a whole new category of aircraft —The Personal Jet. When time is money, there isn’t a second to waste. Nothing makes an impression like arriving at a business meeting in your own personal luxury jet. 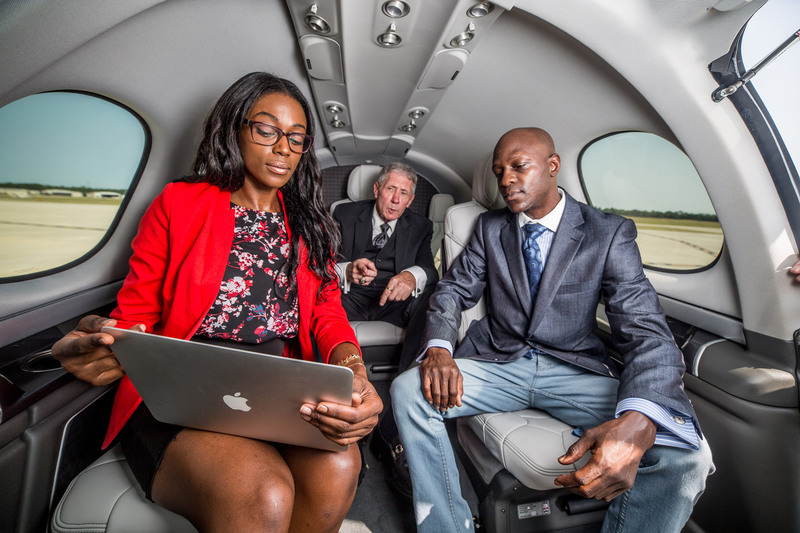 Thanks to EvolveAir’s shared ownership program, professionals at every level can afford to arrive in style and in record time. As a shared owner, your business will benefit in several ways. First, you only pay for a fraction of the costs associated with owning and maintaining an aircraft while having complete freedom to fly as much as you want. Shared ownership may even qualify your business for certain tax advantages. Best of all, you can leverage all the proficiency and perks of owning a private jet without any of the responsibility. EvolveAir handles all maintenance and logistics associated with owning the aircraft, including scheduling trips and planning flights. Business owners, in particular, are attracted to the SF50 because of its quiet, spacious cabin, 5-passenger capacity, modular seating, and of course—unparalleled speed. Economically, the SF50 also makes financial sense. Operation costs are surprisingly low given the prestige and capabilities of the aircraft. In fact, the SF50 burns half as much fuel as other jets that cost twice as much. Expand your business territory, meet face-to-face with clients, and make your presence know. The SF50 Vision Jet will take you to any place in Texas in under one hour, or as far as New Orleans, Oklahoma City, and Tulsa in under two. Enough pep for the performance fanatic and space for the whole family. Spend even less time traveling and more time with the people who count the most. 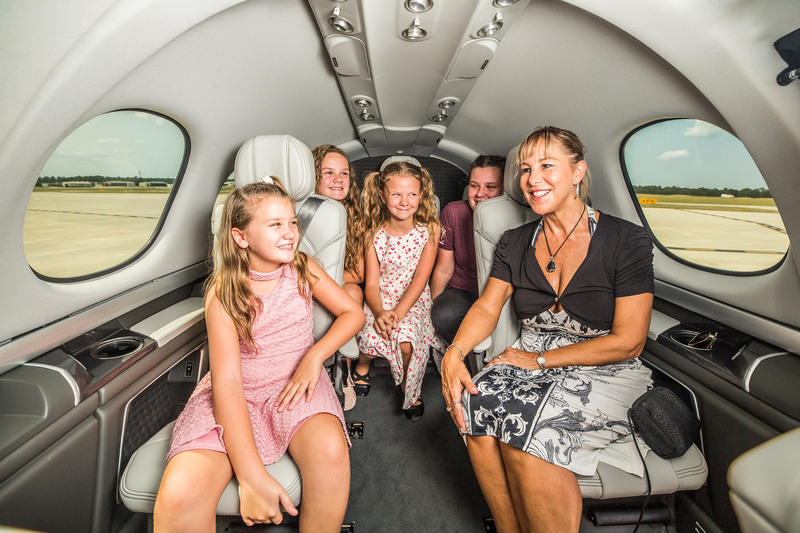 A personal jet for your family or lifestyle is more affordable than you think with EvolveAir’s shared ownership program. As a shared owner, you only pay for a quarter of the costs associated with owning and maintaining an aircraft. Included in your fixed, one-time cost is an annual allotment of flight hours. 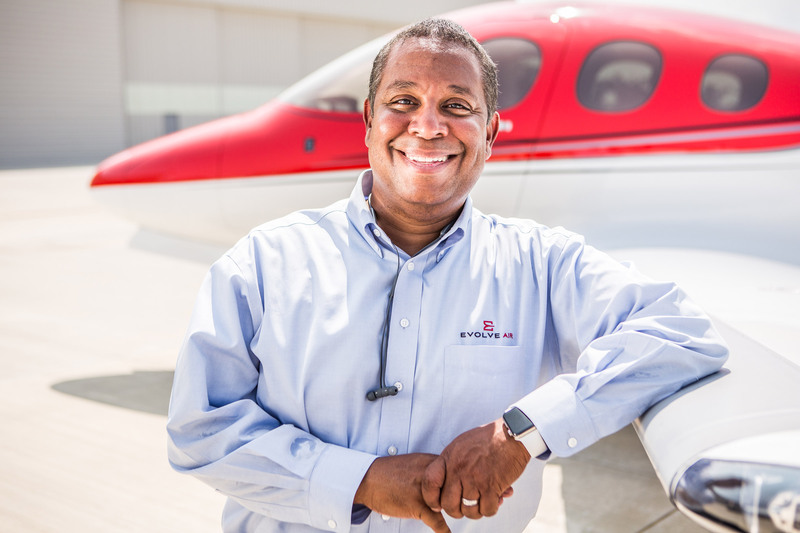 To make your travel lifestyle as stress-free as possible, EvolveAir will handle all the details for you, including maintenance, flight planning, and aircraft pick-up and drop-off at any airport in the Greater Houston area. We even offer first-class insurance and tax support. Your only job is to pick a destination and enjoy the journey. With enough room for friends and carry-on items or even the entire family, quick weekend jaunts will become an exciting way of life. 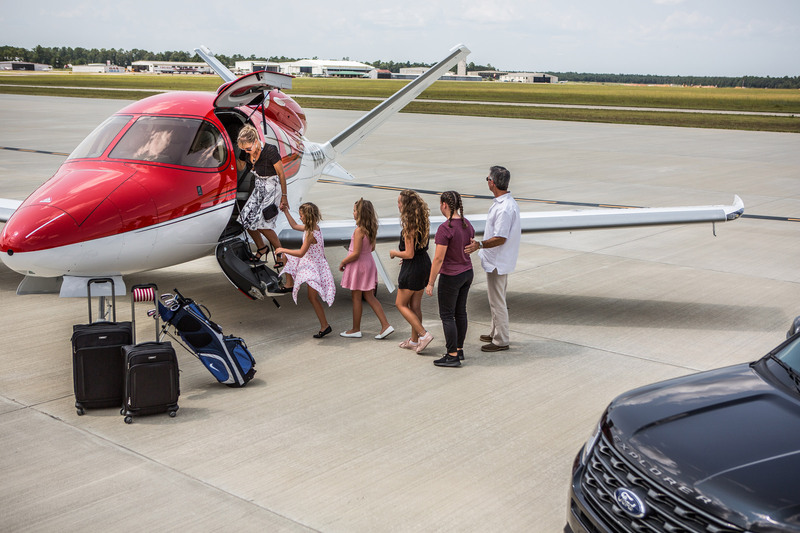 The Vision Jet boasts plenty of room for five adults and two children. 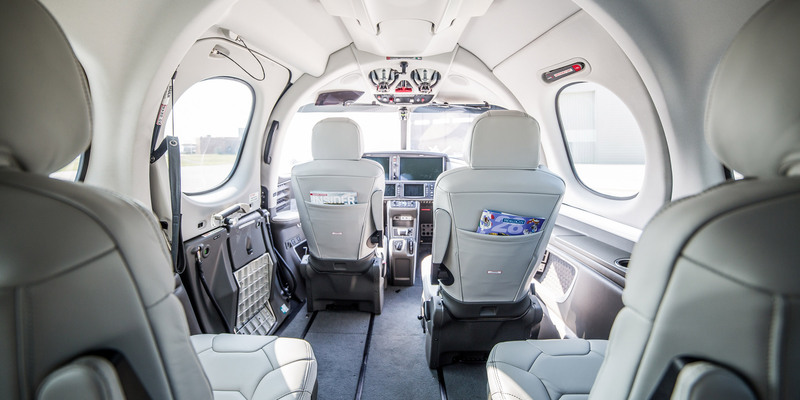 It features revolutionary safety systems to put your mind at ease, like the patented Cirrus Airframe Parachute System (CAPS) and Cirrus LATCH (Lower Anchors and Tethers for Children) system. Take your spouse to Destin for a beautiful beach getaway in just two-and-a-half hours. Rally the crew and hit the Las Vegas strip or finally take that family trip to Orlando. With the Vision Jet, your next adventure is only a few hours away! The first thing you’ll note about the SF50 is how spacious the cabin feels. At 5.1 feet tall, there’s nearly enough room to stand. But after you settle into a silken, two-tone leather seat, we guarantee you won’t want to. Each seat provides 3 recline positions, a personal USB port, and the ability to fold and reconfigure positions depending on the mission—all without compromising leg room. The enlarged windows provide a spectacular panoramic view and fill the cabin with natural sunlight to create an immersive flight experience unlike any other. Passengers will also enjoy climate controls, mood lighting, and an overhead in-flight entertainment system. One of the most attractive features of the SF50 is its recently re-engineered flight deck, which showcases the incredibly intelligent and sophisticated Perspective Touch™ by Garmin® avionics system. Cirrus realized how fundamental “touch” is to our daily interaction with devices. To bring this familiar behavior to aviation, they partnered with Garmin to engineer a touch-screen avionics system that can be controlled similarly to a smartphone. Perspective Touch™ by Garmin® features global satellite connectivity, flight stream technology, Bluetooth data sharing to your mobile device, wireless aviation database updates, and much more. From the moment you book your flight to the moment you hit the sky, your travel experience with the SF50 Vision Jet will be nothing short of extraordinary. Fly out of any airport in the Greater Houston area without ever stepping foot inside a busy terminal. Once in flight, you’ll gain a new respect for the term “full-throttle.” The SF50 is powered by a Williams International FJ33 turbofan that produces over 1,800 pounds of thrust and sends you cruising at 354 mph across 1,200 nautical miles. That’s almost 150 mph faster than the SR22T and nearly 200 nautical miles further. Additionally, the Vision Jet only requires less than 3000 feet of runway, giving owners access to remote landing locations that other aircraft cannot execute. Fly to Austin in less than 40 minutes instead of driving more than three hours. Visit family in Saint Louis in just over two hours. Or fly all the way to Canada on one tank of fuel. The sky is no longer the limit with the SF50 Vision Jet. Max Operating Altitude: 28,000 ft.
Smarter. Safer. Faster. Why Invest in Anything Less?